UVAS provides many fine opportunities for students to get involved in activities, cultural events, government, and community service, all designed to help you grow as a world citizen. It is the responsibility of each student to be familiar with his/her tutor. A list of Tutor and students is being displayed by Senior Tutor Office (city campus); However Students from first year will be informed soon about their tutorial groups. If you have questions about any of the services or policies, please contact the senior tutor office for clarification. All the students are allotted Tutors by the Senior Tutor. A group of about 8-12 students is supervised by a tutor who keeps the records of students in his group and maintains their files. The students are required to keep a close contact with their tutors who render advisory services to them in all academic and non-academic matters. The assessment of student’s conduct and character by the respective tutor is reflected on the character certificates issued to students after completion of degree Program. All the record of a student is forwarded to the respective tutor by the concerned authority of the University. There is a Mega group consisting of 2-4 tutorial groups. This group attends tutorial group meeting under the Chairmanship of a coordinator and meeting is also attended by all the Tutors of the groups included in this Mega group. 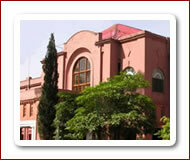 In this period the students carry out co-curricular and extracurricular activities. Mega group meeting is held regularly on the third week of every month. Absentees are imposed a fine @ Rs. 10.00 per absence. However, a regular absentee will not be entertained for any purpose by the tutor. The application of the students in any case will be signed by the concerned Tutor and then forwarded to the related Principal Officer. In case a student files application for a leave, he/she has to contact and get that signed by the tutor initially. Then the leave for a period of seven days will be approved and notified by the Senior Tutor, beyond seven days leave will be approved and notified by the concerned Dean / Principal. If a student remains absent continuously for a period of two weeks, his / her name will be struck off from the University rolls. All students in various degree Programs are offered counseling for the academic matters by the Dean, Director, Principal Officer, Senior Tutor / Warden, Director, Student affairs. Every student admitted to the University shall be required to give an undertaking to abide by the conduct and discipline, rules and regulations of the University and to carry out such other orders and instructions as may be issued by the University authorities from time to time.